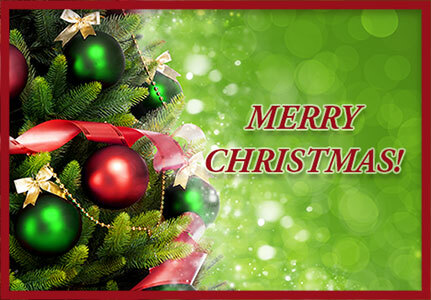 Christmas tree graphics and Christmas tree animations. Plenty of garland, ornaments, flashing lights, presents, stars and angels. Even Santa Claus pitches in and helps decorate a tree or two. 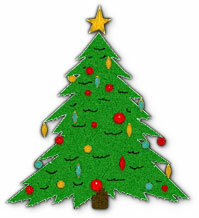 HTML copy and paste code for some Christmas Tree clipart. Christmas Tree with ornaments, presents and flashing lights. Animated Christmas tree with flashing lights and gifts. Christmas tree with Santa and children plus glitter animation. Animated Christmas tree with red and gold ornaments. 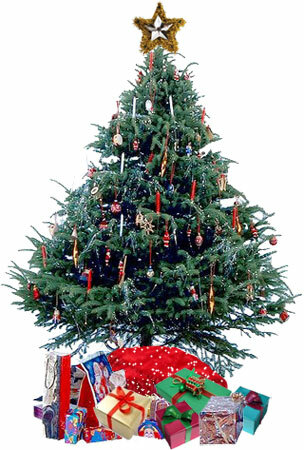 Christmas tree with presents and flashing lights animation. Large Christmas Tree decorated with star plus presents. Christmas tree animation with candles and lights. Christmas Tree with Merry Christmas. Girl with present in front of the Christmas tree. Christmas tree with a big smile animation. Bringing home the Christmas tree on a sled animation. Decorated Christmas Tree with lots of presents. 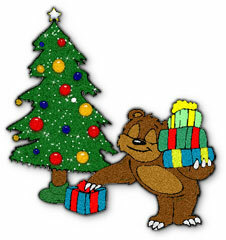 Papa bear placing presents around the Christmas tree. Papa with Presents - code for websites. Christmas tree with gold star on top. Christmas Tree decorated by Santa himself. Santa's little helper in front on a Christmas tree. Image Format - GIF, Image Size - 23 kb, Dimensions - 123 x 145 Pixels, Details - Animated Christmas tree with flashing white lights. Tree is covered with ornaments and ribbons plus plenty of presents around its base. On top is a heart instead of the usual star. 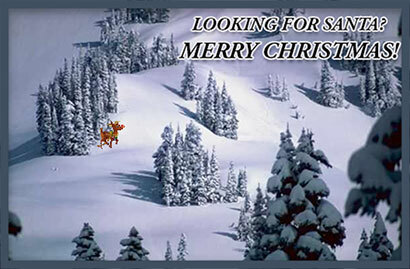 Have you seen Santa or his reindeer? Christmas tree with flashing red lights. 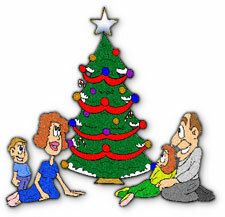 Happy Holidays with Christmas Tree animation. Christmas tree animation with ornaments and lights. Christmas tree with animated lights and presents. Dancing Christmas tree with a big smile animation. 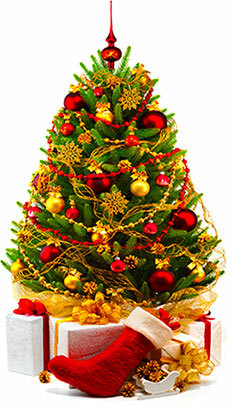 Image Format - GIF, Image Size - 22 kb, Dimensions - 129 x 186 Pixels, Details - Animated Christmas tree with silver and gold ornaments, silver and gold ribbons plus flashing white lights on the tree. 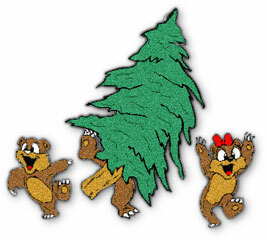 Young bears bringing a big tree home for Christmas. Christmas Tree - code for web pages. 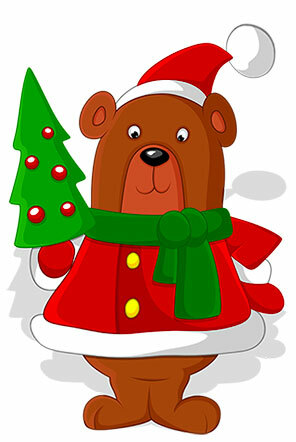 Santa bear in his best Christmas outfit with Christmas tree. Christmas tree with Santa, presents and animation. Christmas tree with bright lights and animation. A Christmas tree animation with candle lights. Christmas tree with presents and red garlands. Image Format - GIF, Image Size - 9 kb, Dimensions - 88 x 112 Pixels, Details - Christmas tree with red and gold ribbons, ornaments, star and animated lights. Little boy standing next to Christmas tree. Family admiring their Christmas tree. 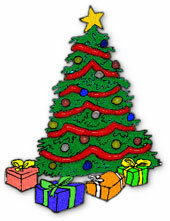 Animated Christmas Tree with star on top and presents below.